The popular Eggstravaganza character egg hunt has returned to Disneyland Park once more. Taking place from April 5 to 21, 2019, this scavenger hunt will delight and challenge guests to find all 12 Disney-themed “eggs” hidden throughout the Park. Whether you choose to hunt down the eggs or not, you can take your map to Disney Showcase on Main Street, U.S.A. to redeem your prize: one of six Disney-themed eggs with a surprise inside. When you purchase an Eggstravaganza 2019 map at Disneyland, it will come with a sheet of 12 stickers. These stickers will be placed on the map once you have found the corresponding Easter egg in Disneyland. The map comes with a clue as to the location of the hidden eggs. But we must warn you––some of these clues are either misleading or not detailed enough to help you easily find the eggs. For example, the “it’s a small world” clue should read “it’s a small world mall,” which is the area that goes from Storybook Land Canals to the “it’s a small world” attraction. Likewise, the “Tomorrowland Platform” clue was not nearly helpful enough when trying to find the hidden egg. If you do get stuck trying to search for the eggs, you can ask a Cast Member nearby for a hint. They will help guide you in the right direction. Maps can be purchased at stores throughout Disneyland Park, but we recommend heading straight for the location right outside Disney Showcase. Here you can purchase your map and redeem your prize. It’s recommended that you redeem right away, so you have the best chance at picking out the egg you want. There are six options to choose from: Maleficent, Aurora, Dumbo, Timothy Mouse, Mickey Mouse, and Minnie Mouse. Each Easter egg comes with a surprise inside, which means double the fun! Also available for purchase are these limited edition Haunted Mansion Eggstravaganza eggs for $14.99. These are likely to be very popular, so don’t wait on purchasing these. There are also two pins available as well, each for $16.99. And now, the rest of this post contains spoilers for the scavenger egg hunt. The locations will be revealed for all of the eggs, so if you wish to keep them a surprise, do not continue on. There are a total of five hidden eggs in Main Street, U.S.A. The locations of these eggs are a mixture of easy and difficult, but our biggest tip is to always look up when searching for eggs. Pluto was one of the easiest Easter eggs to find at the Disneyland Fire Department. But the White Rabbit was one of the more difficult ones. The location on the map simply says “Emporium,” without specifying whether to look inside or outside. We had to ask a Cast Member for help with this egg. The Minnie Mouse egg at Candy Palace wasn’t as difficult to find, but it can be tricky. Again, it helps to look up as most of the eggs are located above eye level. Another tip: if you don’t see an egg outside of the location listed on the map, it’s always good to check inside. This was yet another egg located high up inside a store on Main Street. Along with Pluto, we thought Thumper was one of the easiest eggs to find. 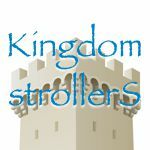 The more challenging part might be finding the Baby Care Center for guests who are not accustomed to venturing this way. The Mr. Toad Easter egg was one of the more challenging eggs to find, based on the unhelpful “Tomorrowland Platform” clue. In truth, we were planning on heading to Fantasyland and returning to find this egg later in the day when we accidentally stumbled upon it. The clue should read “TomorrowLanding” instead. Again, we had a hard time finding this Daisy egg. We searched and searched outside of “it’s a small world” and the gift shop, with no luck. Finally, we decided to ask a Cast Member for a hint which led us to find this egg at the Lemonade at small world Promenade. As far as location, this Donald Duck egg is an easy find. However, we had to step pretty far back in order to see this egg on the roof of Shooting Exposition. Similar to Frontierland’s egg, this was another egg that we almost missed if we hadn’t been standing far enough away from Adventureland Bazaar. Of all the Easter eggs in the scavenger hunt, this might be the most challenging to find. “New Orleans Square” is a pretty vague clue considering how big of a space the Land is. And we almost missed this egg entirely. The balcony railing above Blue Bayou makes it pretty difficult to spot, so we think this egg should have been placed somewhere else. Truthfully, we found this egg rather quickly because we spotted other Eggstravaganza guests taking photos of it. We weren’t sure whether this Dale egg would be found inside or out, but we happened to see it on the roof of Pooh’s Corner before we headed in the shop. Once again, be sure to keep your eyes up high. Dale was the last egg on our map, which looks festive once it’s been filled with stickers. Overall, we found Eggstravaganza 2019 at Disneyland to be very fun, but a bit challenging. The challenge makes the Easter egg prize even more rewarding in the end. Will you be taking part in Eggstravaganza this year? Which Disney-themed egg will you choose for your prize? Do you know if the hunt is available all day? What do each one come with?